Summer is coming, are you ready? Welcome to "Grace Karin USA", a variety of vintage dresses are for you! Floral printed, Plaid & Check pattern, Polka Dot!!! Three patterns are be your choose! Fabric: 96%Cotton + 4%Spandex, Cotton Blend, Soft and Comfortable material, great for Children's Skin! Matched PU Leather belt is removable. It is possible to adjust to your favorite length. Round Neck design, not only Simple and Elegant, but also Sweet and Cute, embodied in a perfect princess temperament! Vibrant Floral Printed, pretty flower pattern gives a feeling of Retro, perfect for spring! * Please confirm the dress purchased from "Grace Karin Store" before ordering and don't buy any imitation from other store. * Please check the size chart carefully on the left images before ORDERING. * Our kids' dresses are designed to allow room for growth, height is a better reference than age in choosing the correct size. 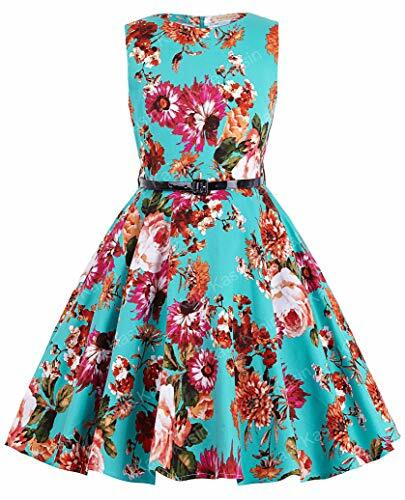 * Wearing this floral dress with a petticoat will make you look more puffy. * More classy vintage dresses for adult available in our store, you can also buy one for yourself, a good choice to wear Parent-child Dress with your young lady. Please check the size chart carefully on the left images before ORDERING 96%Cotton + 4%Spandex, Sleeveless, Zipper Back, Vibrant Flower Patterns, Polka Dot Prints, Full Circle Vintage Dress in Summer, Fit and Flare Effects Suitable Occasion: Different Colors and Patterns suit Different Occasions. Birthday, Party Outfits , Banquet, Playwear, Sundress, School Dress etc are all included. Casual or Special , You can find one you need. Please confirm the dress purchased from "Grace Karin Store" before ordering and don't buy any imitation from other store More classy women dresses available in our store, it is a good choice to match them as Mother Daughter Dresses.